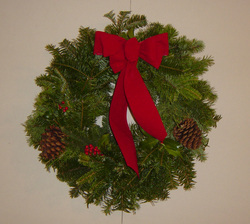 During November, we use fresh-cut greens to create beautiful wreaths and swags to decorate your home for the holidays. Our wreaths are built on sturdy 12" or 16" rings. Prices range from $27 - $50 depending on size and decoration. We make all wreaths on site on a time-available basis. We don't make any wreaths after Thanksgiving. Things are simply too busy. If you'd like to reserve a wreath in the pre-season when you reserve your tree, just let us know. We can custom make it to your specifications and have it ready when you pick up your tree. 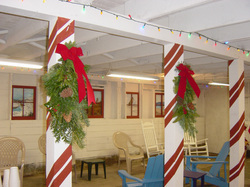 Bundles of loose greens and holly for holiday decorating may be available for purchase if we have sufficient supply. Bundles are $5 and $10 each.